"Well, if you haven't eaten lately, you should eat soon," he said. 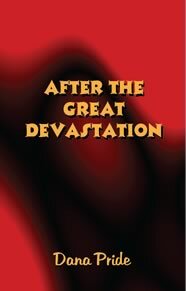 A global disaster, known as The Great Devastation, has drastically changed life on earth. Layla, a Kidgen, or Kid-Genius, is living and working at the Complex, where the Insiders have everything they needed provided for them: food, clothing, entertainment. Layla is aware of the Outsiders, (the Ordinaries, the Crims, the Chairs and the Runners) who are just scraping by without the use of technology, but she doesn't have any reason to think much about them - until Kenrick, one of her friends who is also a Kidgen and a Comgen (Computer-Genius), secretly arranges for four friends to travel. Suddenly Layla becomes curious. What is life Outside really like? Where will they go? What will they eat? Will they be able to get back safely and unpunished? Kenrick has a few surprises in store for them - especially for Layla, whose life will never be the same after journeying Outside the Complex. Also available! Book 2 of the Devastation Trilogy: "The Hidden City"
and Book 3: "Immediate Search"